As Christmas approaches, we trim our air signal as you’d trim a tree, gradually adding Christmas hymns and carols and Christmas educational and inspirational spots and prayers. Leading up to December 25th, we broadcast annual Christmas plays produced by our volunteers since 1973, some prayerful, some with a lesson, some based upon seasonal classics, some just plain fun. On our annual day-long holiday call-in, hundreds of listeners will offer greetings to friends and loved ones—in past shows, as many as ten thousand people have been named with kindness. Of course, the best feature will be midnight Mass Christmas Eve, and Mass again Christmas Day. You help foster great joy and great prayerfulness in a far-flung region where poverty flourishes and where many folks need an extra boost of encouragement. You have our deepest, most heartfelt gratitude, and our fondest hopes that you will find joy and peace, and many blessings from Our Almighty Father. Thank you! 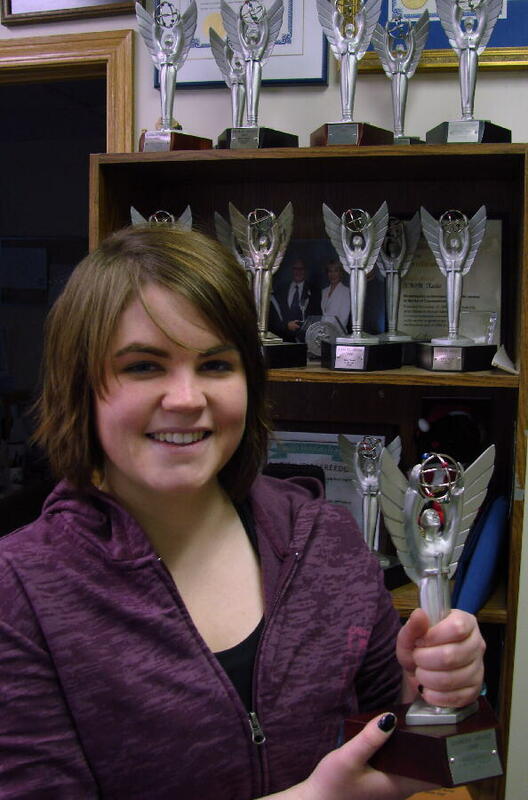 CHOIR OF ANGELS: (left) KNOM’s newest volunteer, Leah Radde, holds KNOM’s newest Gabriel, the 2009 Religious Radio Station of the Year Award. It is KNOM’s 17th top Gabriel. Started in 1965, the annual Gabriels were created to honor radio, television and film organizations and projects that “uplift and nourish the human spirit. To us, the greatest honor is the affection and loyalty of our listeners, and of the good people like you who make our important work possible. Thank you! KNOM, with 25,000 Watts AM, is the oldest Catholic radio station in the United States, on the air since 1971, serving forty villages scattered throughout 100,000 square miles, thanks to you. CHRISTMAS INSPIRATIONAL SPOT: They visited Him. Adored Him. Brought Him gifts. The wise and rich and powerful, the poor shepherds, the angels. The Infant held His arms wide open in love. Thirty-three years later, these same arms stretched wide open in love again—for you and me. 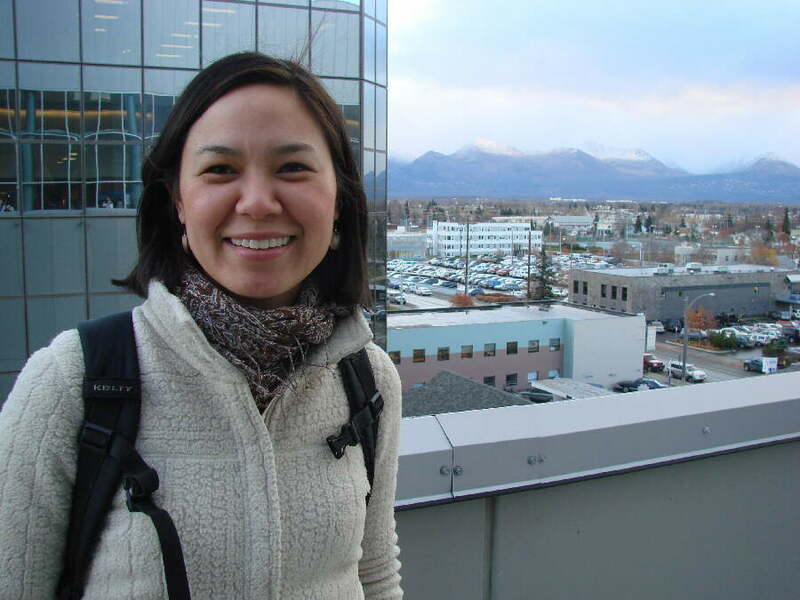 CONVENTION: (left) In the autumn, “local” news found KNOM public affairs director Laureli Kinneen in Anchorage, 539 miles distant, to cover the annual gathering of the Alaska Federation of Natives. Thanks to a feed provided by the gathering, KNOM offered everyone in western Alaska a front-row seat for the daily proceedings. Thank you for helping with these broadcasts for our isolated listeners! IT’S NEWS TO US: News director Paul Korchin has been busy. In addition to hard news such as crashes and searches, KNOM newscasts this past month featured information on bootlegging penalties, the status of permafrost, low salmon runs, H1N1 influenza, management of Alaska Native subsistence hunting and fishing, landfill issues, the sea otter population, the Coast Guard’s presence, dental health, the use of the Yup’ik (YOO-pik, central and southern Eskimo) language in schools, gold mining, sewer and water systems’ issues in Alaska, and Alaska Native art, among many others. A November call-in program which Paul produced invited listeners to share the origins of their names, and KNOM’s phone lines were choked with callers who related fascinating stories. The origins of some Native language names are lost to history. Others evolved after westerners arrived and were Anglicized. 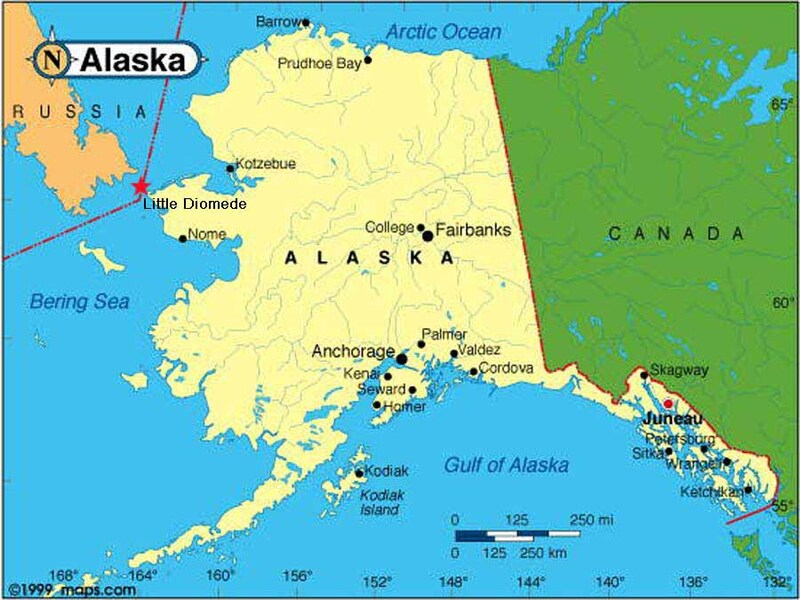 “The missionaries really tried to get them right,” one man said, but the phonemes of the Alaskan languages were foreign to them. One Yup’ik gentleman explained the origin of his legal surname, “Beans.” His grandfather was cabin boy on a Yukon River paddlewheel steamship, and beans were apparently the only western dish he would tolerate. The family also keeps a Yup’ik surname. We are deeply grateful to you for helping to keep such positive, lively discussions on the air. IT'S NOT NEWS TO US: You can imagine how startled we were to discover that from some time in August through late October, a phony web site appeared, purporting to be a KNOM news archive. The phony page, and seven other bogus pages appearing to be those of Alaska newspapers, were established by NBC Universal to fool people into thinking that its mass alien abduction movie "The Fourth Kind" depicted a true story based in Nome, as the film's publicity boldly claimed. Of course, the claim was false. NBC Universal has apologized for its illegal impersonations, has removed the pages, and for penance, is donating $20,000 to the Alaska Press Club, $2,500 to a scholarship fund, and $5,000 to a Nome group which aids the homeless. (Left) IT’S NOT THAT COLD on this blustery November day, but it sure is windy. The photo was taken shortly after volunteer Linda Maack returned from the village of Savoonga, to cover a two-day suicide prevention training workshop. As we noted last month, suicide is a terrible scourge of this region. ASSIST (Applied Suicide Intervention Skills Training) has been around since 1983, but this was the first session that was tailored for an Alaskan village. The national group organizers liken the training to teaching first aid, or CPR. (Left) Savoonga is located on Alaska's St. Lawrence Island, 164 miles southwest of Nome. It was isolated for many years: the first celebration of Christmas there was in 1947, when Presbyterian missionaries shipped in a Christmas tree. Siberian Yupik, spoken on the Russian coast, is the primary spoken language. In audience measurement surveys, the village of 722 souls has continued to demonstrate intense loyalty and affection for the KNOM signal. MULTI-PURPOSE: Since it signed on in 1971, our mission has shared many purposes. We are on the air to further the Catholic faith, to gently teach it, to provide inspiration, the Rosary and the Mass. We work to preserve the unique cultures of our listeners. We work to inform them of events and issues, national and international, as well as regional and local. Our call-in programs feature discussions on solutions to problems that are endemic to the area, as well as the sharing of cultural ideas. Every voice is treated with respect. We strive to educate, not as a lofty professor, but as a friend. To maintain a large audience (up to 100% of adults in some villages are daily listeners), we make listening fun, blending all of this among popular music of many kinds. Thank you for making this possible! 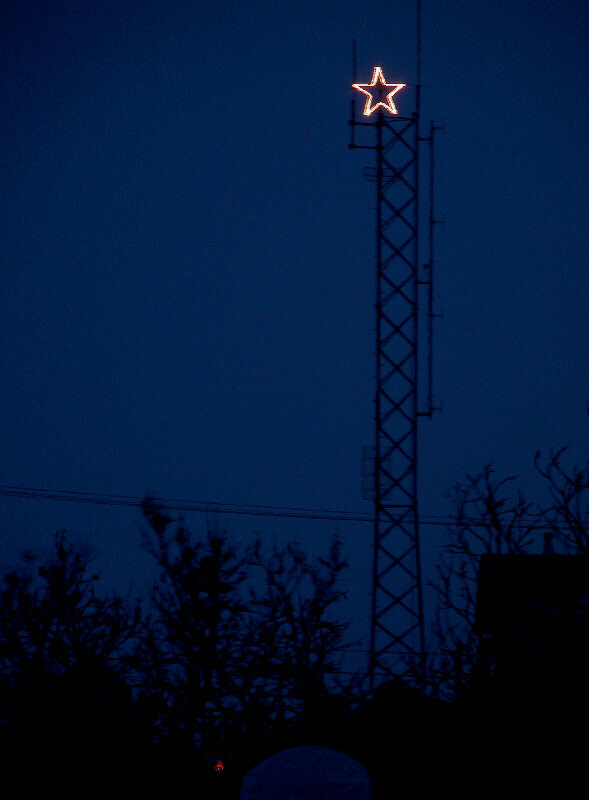 A STAR IS BORN: (left) Since 1971, a lighted star has proclaimed Jesus' birth from atop the microwave tower at the KNOM studio during the Christmas season. In this image from last year's Christmas edition, volunteer Dave Dodman, now KNOM outreach director, admires the star from below. (Below, left) 85 feet above ground, the KNOM Christmas Star is a feature of the Nome holiday skyline. It's the second-tallest object in Nome. Interestingly, the tallest is a lighted cross atop Old St. Joseph's Church, the 1901 Catholic church that was laicized and serves as town meeting hall. Please consider adding the KNOM Radio Mission to your will. We prayerfully place all bequests into funds that will provide for future major improvements and protect the mission during emergencies. For most of us, such a gift provides a legacy that is only possible once we are united with Our Lord. CHRISTMAS INSPIRATIONAL SPOT: As I put up my Christmas tree, help me, Lord, to decorate my life, too. For each ornament I hang, let me bring a kindness to someone. For each bright colored light, a smile and a laugh to another, so that my life radiates joy as much as my tree. � Keep Christ in Christmas. 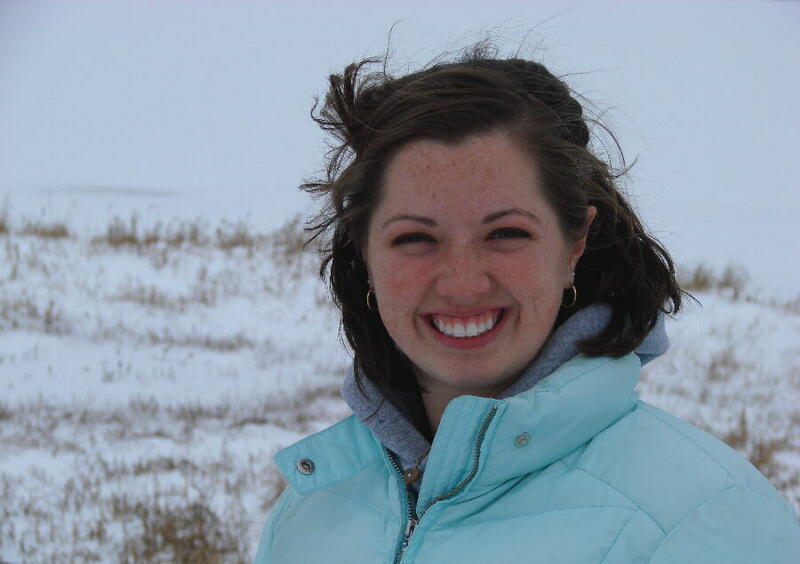 � Pause to consider the immensity of God’s gift of Christ to humankind. � Be generous in giving to the needy. � Plan for the happiness of those who are outside of your family and friends. � Give gifts for the simple joy of sharing. � Be patient and understanding with those who bear a burden at Christmas. � Remember that just as Jesus the Christ is God’s gift to us, we can make our celebration of His birth a gift to God. 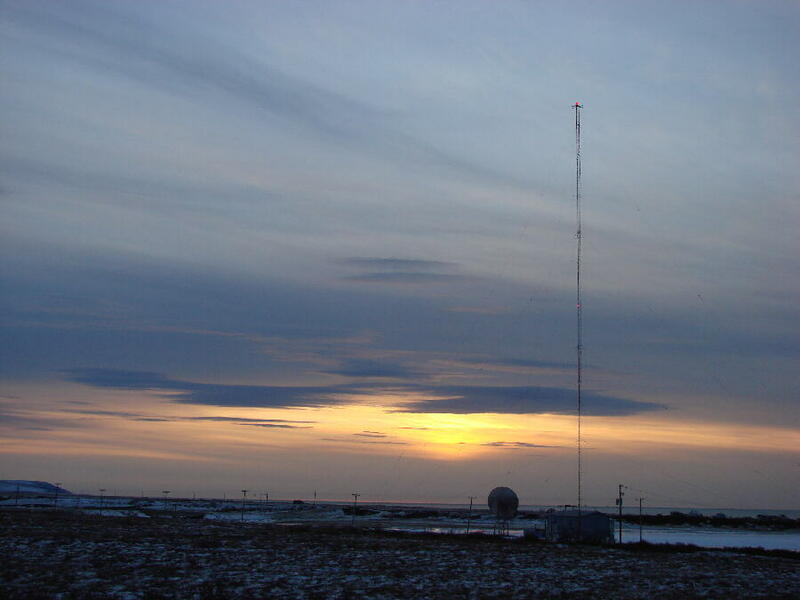 UP AND AT ‘EM: (left) Shortly before 11 AM on this November morning, the sun appears at the remote KNOM transmitter site. Three days after this photo was taken, Nome was pasted with snow, and two days after that, endured its first rip-roaring multi-day blizzard. THIRTY YEARS AGO: December 1979: Villagers have cleared a runway on the ocean ice along the International Date Line. Volunteer reporter Diana Gardenier is on the first plane of the season to land at Little Diomede Island. (Left) Little Diomede is arguably the most remote and inaccessible community in the United States. In spring 2006, KNOM volunteer Jesse Zink flew there. 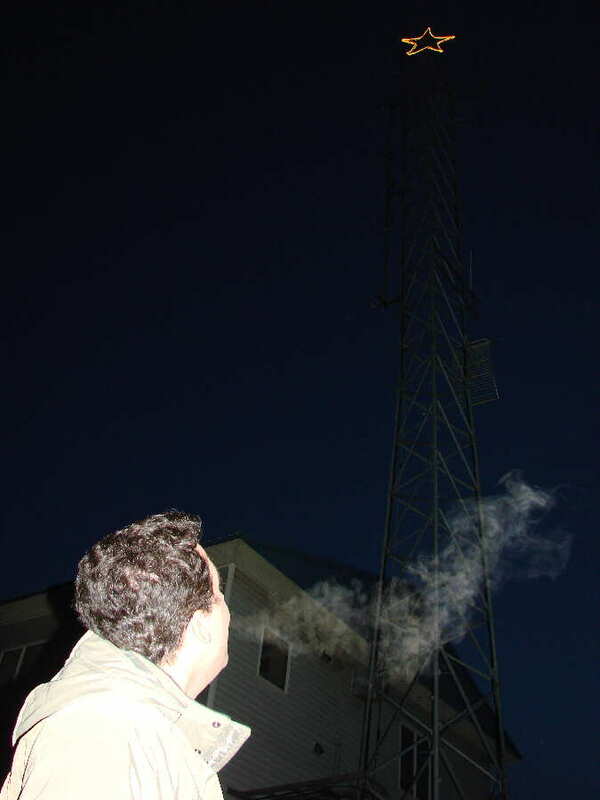 For several images, and more information from Nome Static Transmission #488, click on the image or the link. (Left) Click to see the location of Little Diomede in the Bering Strait. TWENTY YEARS AGO: December 15, 1989, 480 miles southeast of Nome, Mount Redoubt volcano erupts, spewing great clouds of sulfurous volcanic dust into the air. While the debris avoids Nome, the corrosive billows of grit ground airplanes at Anchorage, western Alaska’s supply hub. Grocery shelves grow bare, holiday presents are missing and Nome’s mailboxes lie empty for a week. TEN YEARS AGO: December 31, 1999, KNOM declines covering a 3-mile sled dog race, in order to broadcast Pope John Paul II’s millennial address, scheduled for midnight Rome time, 3 PM in Nome. Not wanting to hold the race without KNOM, the Nome Kennel Club delays its “Y-2-Canine” race start until after the pope is finished. Concerned with “Year 2000” computer issues, general manager Tom Busch, program director Ric Schmidt and chief engineer Les Brown celebrate a sober New Year’s Eve in Studio A, carefully watching KNOM’s computer systems as the clock ticks toward midnight. At 12:00:00 AM, the system that controls the station’s audio stops for a heartbeat, and resumes working. ON CHRISTMAS DAY, as every day, you and all of your intentions will be in our prayers. May you and everyone you love be filled with God’s graces during this season and always. May you enjoy a happy and holy Christmas, and may God bless you abundantly for your generosity!